Zhao, Y., Zhang, T. and Guo, H. (2017). Penetration Assays, Fungal Recovery and Pathogenicity Assays for Verticillium dahliae. Bio-protocol 7(4): e2133. DOI: 10.21769/BioProtoc.2133. Verticillium dahliae is a soil-borne phytopathogenic fungus that infects host roots and proliferates in vascular tissues. The great loss of economically important crop caused by V. dahliae has raised worldwide concern, however, little is known about the mechanism of its pathogenicity (Klosterman et al., 2011; Yadeta and Thomma, 2013). Our recent work has shown that V. dahliae develops hyphopodium as an infection structure to breach plant root cell wall (Zhao et al., 2016). Here, we provide a detailed protocol to analyze the penetration ability and the pathogenicity of V. dahliae as well as recover fungal hyphae from infected cotton stems developed from our previous studies (Zhang et al., 2016a and 2016b; Zhao et al., 2016). Cellophane membrane has been used in inducing appressorium development of foliar pathogens but not root pathogens (Bourett and Howard, 1990). We adopted the method of using the cellophane membrane to induce and assess the development of hyphopodium. Hopefully, it will greatly promote the research of molecular events involved in recognition of the host that regulate infectious development. This protocol is also helpful to identify the key component controlling the pathogenicity of V. dahliae and widen our understanding of the mechanism of plant-microbe interaction. The cellophane membrane has been widely used to study the development of infection structure in foliar pathogens (Bourett and Howard, 1990; Kleemann et al., 2012; Gu et al., 2014), we firstly adopt this method to induce infection structure in root pathogen of V. dahliae, which is a simple and efficient method to study the hyphopodium development. Also, we previously developed a novel unimpaired root dip-inoculation method to assess the pathogenicity of V. dahliae in cotton (Gao et al., 2010). The regular procedure for infection of plants with the soil-borne pathogen is to uproot soil-grown plants, incubate the roots in a conidial suspension, and then replant the plants in fresh soil. Our inoculation method avoids damaging the roots and is convenient for operation, which combined the protocol of fungal recovery from stem facilitates the pathogenicity study of soil-borne pathogens that colonize the vascular tissues. Pipette 20 μl conidial suspension (3 x 107 conidia per ml) of V. dahliae stored at -80 °C in 20% glycerol and plate the suspension culture onto the PDA plate and incubate for 5 days at 26 °C in the dark. Prepare Minimal medium (MM medium) and autoclave 20 min at 113 °C. Pour plates after cooling the medium down to 50-60 °C and dry the plates in a clean bench. Cut the flat sheet membranes of cellophane into circles of 90 mm diameter and autoclave 20 min at 113 °C. Lay one circle on each MM plate prepared in step A2. Use a sterilized pipette tip to inoculate the fungi from step A1 onto the cellophane membrane overlaid on the MM medium. Grow cultures for 3 days at 26 °C in the dark. Then remove the membrane and incubate the medium for 7 days to observe hyphae in the underlying medium for determination of breach of cellophane (Figure 1). Figure 1. Penetration assay on the cellophane membrane. A. Uncovering the membrane from the MM plates with a colony of V. dahliae at 3 days post inoculation (dpi). B. The colony of V. dahliae on the underlying medium indicating the penetration of cellophane membrane. Susceptible upland cotton (cv. Xinluzao NO. 16) and strain V592 of V. dahliae were used in our lab for pathogenicity assays. Sterilize cotton seeds for 15 min and rinse three times with distilled water. Soak the seeds overnight at room temperature. Germinate seeds in pots filled with wet soil and cover with plastic dome for one week to grow seedlings until two cotyledons are fully expanded. Transplant 12 seedlings per pot with MS liquid medium and grow at 26 °C with a 16 h light (8,000 lux)/8 h dark cycle for about 2 weeks before inoculation of V592. Streak V592 onto fresh PDA plates (from older PDA plates or glycerol stocks) and incubate for 1 week. Transfer one plate (90 mm) of mycelia by a sterilized blade into 200 ml Czapek-Dox medium with shaking at 200 rpm for 3-4 days at 26 °C in the dark to obtain conidia. Prepare the conidial suspension through filtrating the fungal cultures with 4 layers of sterilized gauze to remove mycelia. Measure the concentration of conidia in the suspension using a hemocytometer and adjust to approximately 1 x 107 conidia per ml with Czapek-Dox medium. Immerse the roots of seedlings with two true leaves to the conidial suspension from step B4 for 1 h (Figure 2A). Put back the inoculated seedlings to MS liquid medium and supply water once a week. Count disease incidence by the percentage of cottons that showed wilting symptom at 30 dpi (Figure 2B). The infection assay was repeated at least three times with 3 pots of cotton each trial. Figure 2. Pathogenicity assay of V. dahliae. 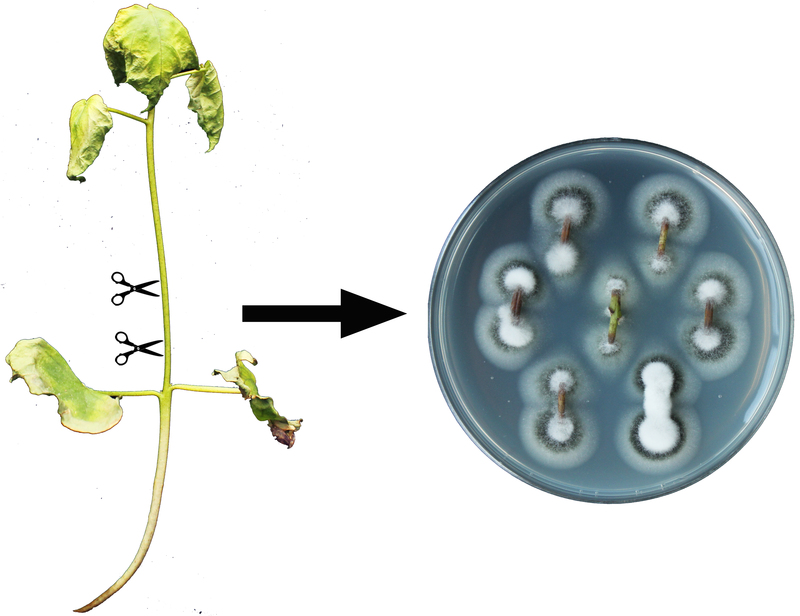 A. Root-dip inoculation of cotton seedling with conidia suspension. B. Representative disease symptom in cotton at 30 dpi of V. dahliae. To identify the colonization of V. dahliae in vascular tissues, we isolate the inoculated cotton stems to recover the fungi. Cut the stem above cotyledons of cotton at 30 days post inoculation (Figure 3). Sterilize the stem sections for 1 min in 70% ethanol within a 50 ml conical tube followed by 60 min in 40 ml of 10% (v/v) H2O2 (dilute the 30% [v/v] H2O2 with distilled water). Revolve the tube on the rotator at 20 rpm during this process. Rinse the stems three times with sterilized water for 3 min each time and culture at 26 °C on PDA medium in the dark. The colonies of V. dahliae can grow on the stems within 1 week (Figure 3). Data from at least three biological repeats were obtained and one-way ANOVA was used to analyze the disease incidence with Microsoft Excel (Table 1). Table 1. Analysis of disease incidence. Disease incidence was counted by the percentage of diseased cottons in 3 pots of infected cottons (3 x 12, total 36 cottons). Assay was repeated 3 times. Each of cellophane membranes should be separated by a filter paper to prevent adhesion during autoclaving. To prevent shrinkage of the cellophane membrane, it is soaked into sterilized water firstly before putting on MM plate. This protocol was developed from the following published paper: Bourett and Howard, 1990. This work was supported by grant from the Strategic Priority Research Program of the Chinese Academy of Sciences (XDB11040500) and the China Transgenic Research and Commercialization Key Special Project (2014ZX0800908B). Bourett, T. M. and Howard, R. J. (1990). In vitro development of penetration structures in the rice blast fungus Magnaporthe grisea. Can J Bot 68(2): 329-342. Gao, F., Zhou, B. J., Li, G. Y., Jia, P. S., Li, H., Zhao, Y. L., Zhao, P., Xia, G. X. and Guo, H. S. (2010). A glutamic acid-rich protein identified in Verticillium dahliae from an insertional mutagenesis affects microsclerotial formation and pathogenicity. PLoS One 5(12): e15319. Gu, S. Q., Li, P., Wu, M., Hao, Z. M., Gong, X. D., Zhang, X. Y., Tian, L., Zhang, P., Wang, Y., Cao, Z. Y., Fan, Y. S., Han, J. M. and Dong, J. G. (2014). StSTE12 is required for the pathogenicity of Setosphaeria turcica by regulating appressorium development and penetration. Microbiol Res 169(11): 817-823. Kleemann, J., Rincon-Rivera, L. J., Takahara, H., Neumann, U., Ver Loren van Themaat, E., van der Does, H. C., Hacquard, S., Stuber, K., Will, I., Schmalenbach, W., Schmelzer, E. and O'Connell, R. J. (2012). Sequential delivery of host-induced virulence effectors by appressoria and intracellular hyphae of the phytopathogen Colletotrichum higginsianum. PLoS Pathog 8(4): e1002643. Klosterman, S. J., Subbarao, K. V., Kang, S., Veronese, P., Gold, S. E., Thomma, B. P., Chen, Z., Henrissat, B., Lee, Y. H., Park, J., Garcia-Pedrajas, M. D., Barbara, D. J., Anchieta, A., de Jonge, R., Santhanam, P., Maruthachalam, K., Atallah, Z., Amyotte, S. G., Paz, Z., Inderbitzin, P., Hayes, R. J., Heiman, D. I., Young, S., Zeng, Q., Engels, R., Galagan, J., Cuomo, C. A., Dobinson, K. F. and Ma, L. J. (2011). Comparative genomics yields insights into niche adaptation of plant vascular wilt pathogens. PLoS Pathog 7(7): e1002137. Yadeta, K. A. and Thomma, B. P. (2013). The xylem as battleground for plant hosts and vascular wilt pathogens. Front Plant Sci 4(97): 1-12. Zhang, T., Jin, Y., Zhao, J. H., Gao, F., Zhou, B. J., Fang, Y. Y. and Guo, H. S. (2016a). Host-induced gene silencing of the target gene in fungal cells confers effective resistance to the cotton wilt disease pathogen Verticillium dahliae. Mol Plant 9(6): 939-942. Zhang, T., Zhao, Y. L., Zhao, J. H., Wang, S., Jin, Y., Chen, Z. Q., Fang, Y. Y., Hua, C. L., Ding, S. W. and Guo, H. S. (2016b). Cotton plants export microRNAs to inhibit virulence gene expression in a fungal pathogen. Nat Plants 2(10): 16153. Zhao, Y. L., Zhou, T. T. and Guo, H. S. (2016). Hyphopodium-specific VdNoxB/VdPls1-dependent ROS-Ca2+ signaling is required for plant infection by Verticillium dahliae. PLoS Pathog 12(7): e1005793. How to cite: Zhao, Y., Zhang, T. and Guo, H. (2017). Penetration Assays, Fungal Recovery and Pathogenicity Assays for Verticillium dahliae. Bio-protocol 7(4): e2133. DOI: 10.21769/BioProtoc.2133.